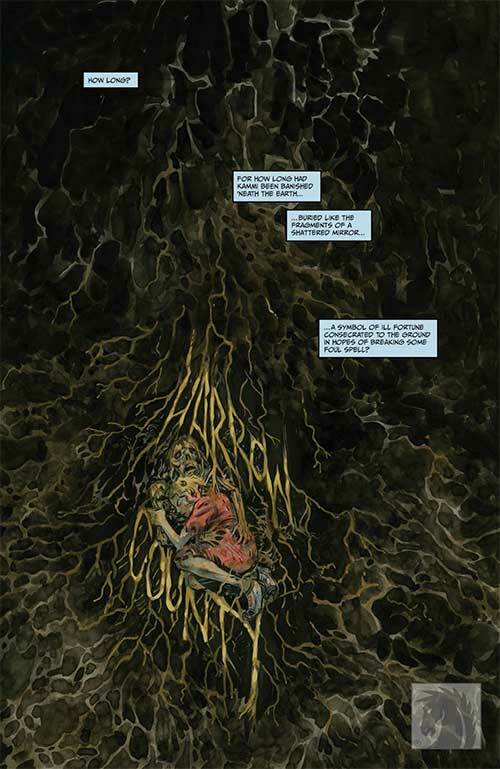 The twenty-fifth issue of Harrow County starting out with a scene wherein we see a morbid image of Kammi ‘banished ‘neath the Earth,’ buried underground in hopes of breaking a spell. She’s not dead, however. We see this when she opens her eyes. She can’t open her mouth without gagging, however, and she seems to have no idea how long she’s been down there. All she wanted, we’re told, was to know the sister she’d been estranged from. And she was punished for it. Eventually Kammi felt a beacon calling her to the surface. She made her way out, crawling up through the dirt, with revenge on her mind. She would turn Harrow County into Hell. Elsewhere, Emmy and Bernice are rushing. Lovey didn’t organize anything so it’s taking longer for Bernice to get the supplies in order than Emmy would like. Emmy’s upset because she thinks she’s figured out the truth behind Levi, Odessa and the other members of her ‘family.’ They need to stop them. 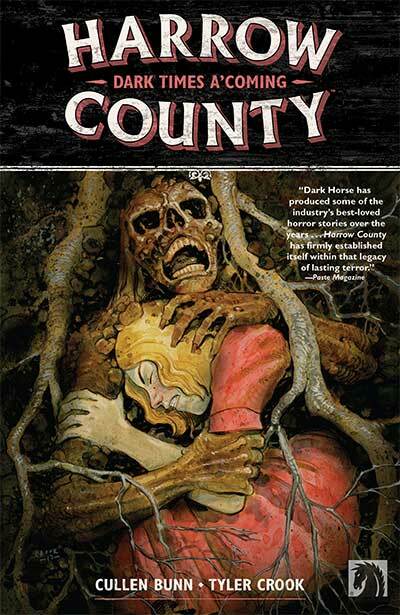 They’ve haunted Harrow County for ages, but they were unable to attack Hester Beck because she was protected by a pact that they’d made. When Emmy was born, she was under that same protection and while that meant that they couldn’t physically harm her, it didn’t mean they couldn’t turn people against her, even her own ‘ma and pa.’ Emmy say Kammi, her sister, the one who embodied all the evil the townsfolk figured Emmy would be, die – but she figures Levi and the others are going to bring her back to get to her. Emmy figures the only thing they can do is talk to Malachi. Emmy’s suspicions are correct – the family does bring Kammi back and they do intend to have her do her harm. But Kammi’s got ideas of her own. When Emmy and Bernice meet with Malachi, he confirms it – and he also tells them how Emmy and Kammi’s true identities tie into the county’s past and Hester Beck in particular. Emmy is in the woods, her Pa stuck on the other side of some branches and brush. None of the haints in the woods will listen to her, save for the skinless boy, and he’s unable to get to Pa. Not at first, at least. Emmy urges him on and he makes it through, though he’s bloodied up by the time he gets through. Regardless, he makes it to the farm, well aware of what he’s going to find once he gets there – a slaughtered cow, its distraught calf terrified beside its mother’s corpse. And Pa’s body. And while the skinless boy, essentially a feral creature, knew what he was getting into, he still feared for Emmy and for what would come of this when she found out. Emmy, meanwhile, is still stuck in the woods, Kammi teasing her from within the safety of the old tree she’s taken shelter in. Suddenly, as Emmy pounds away at the tree, the woods open up for her and let her pass. She runs to the farm and finds what we already know to be true – Pa’s been killed. In anger she scolds the skinless boy, he should have gotten here sooner, but she apologizes, she knows she just said it out of anger. That doesn’t stop the haint from running away, clearly upset about all of this. Issue twenty-seven starts out with a flashback. We see Bernice talking to Lovey, that old lady that tutored her, they’re talking about how things like dried out onions and old snake skin can make a potion strong enough to save your hide if you happen to come across a real with. The Bible will help too, but they’ll need more than just the good word to actually hurt witches. The Lord put things on the Earth so that his warriors might find them and put them to good use. She teaches her how to make ‘Witches Salt’ and other tricks. She teaches Bernice how she can kill a witch if she needs to. Bernice isn’t so sure she needs to, she’s certainly sure that she doesn’t want to. Cut to the present where a well-armed Bernice, who clearly paid attention to her lessons, is facing off against Kammi, ordering her to leave lest she make her regret this decision. The skinless boy is there at Bernice’s side as Kammi tells everyone within earshot that she’ll leave everyone else alone – she only wants Bernice, and Emmy of course. The two young women do battle. Emmy, meanwhile, is digging a grave for Pa. He tried to live a normal life and deserves a normal burial. But Emmy realizes she’s being watched, and when she figures out by who she heads over towards them to give them what for. She figures they’re the ones that killed Pa. The skin that’s been in her side bag for so long crawls free. Emmy heads towards the tree, the tree that started it all when Hester Beck had been hanged from it. She sees Hester’s corpse and then it starts to make sense. Emmy/Kammi/Hester – clearly there’s a connection here. There always has been. But then there’s Bernice and the skinless boy. Issue twenty-eight starts with another flashback as we see how Hester Beck called up ‘a lost ship from the depths’ - an impressive feat made all the more impressive by the fact that she was still very much a novice when it came to witchcraft. This was also when Hester ‘went rogue’ so to speak, killing kindly old Amaryllis so that she could eat her flesh and gain her powers. In the present, Emmy stands face to face with Kammi. She now knows that Kammi isn’t interested in a ‘live and let live’ option – one of them has to die for this to be settled. Kammi pushes. Tells Emmy how and why they’re more alike than she’ll ever admit. But when she makes a crack about killing Emmy’s Pa, Kammi finds Emmy’s hands around her throat faster than she thought possible. They fight, with fists at first, but Kammi won’t die like a regular person. She makes Emmy realize that when she starts pulling up some of the townsfolk’s houses, with people still in side, and then slams them down on Emmy. Convinced that she’s killed Emmy, Kammi starts to get prideful, which gives Bernice, injured by not taken out by the attack, a chance but of course, Kammi is much more powerful and, of course, Emmy isn’t quite finished yet. She means to finish this, and so she does, but in a way that will not only shock readers, but also tie in quite a few of the series’ plot threads into one twisted, horrifying set piece that is as repulsive as it is seemingly inevitable. The cliffhanger to end all cliffhangers ends this issue in a huge way. Bunn’s writing has never been better, tying the series’ past into its present and clearly its future, forcing Emmy to evolve in ways she never expected or wanted to. The kid gloves are off, this one hits harder than anything in the series thus far. At the same time, it’s a testament to the quality of the writing that we care about Emmy as much as we do, and want the best for her. 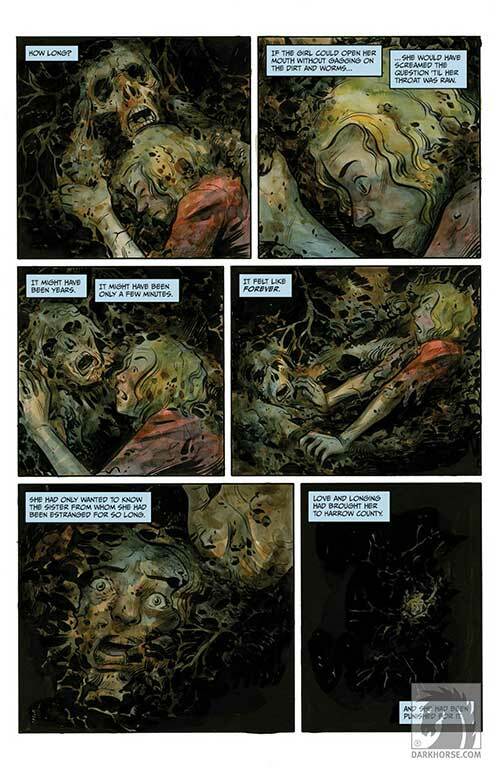 We want good to triumph over evil – but there’s no such things as a sure bet, at least not in Harrow County. Complementing Bunn’s chilling set pieces are Tyler Crook’s illustrations, bringing all of this to life in horrifyingly beautiful detail. 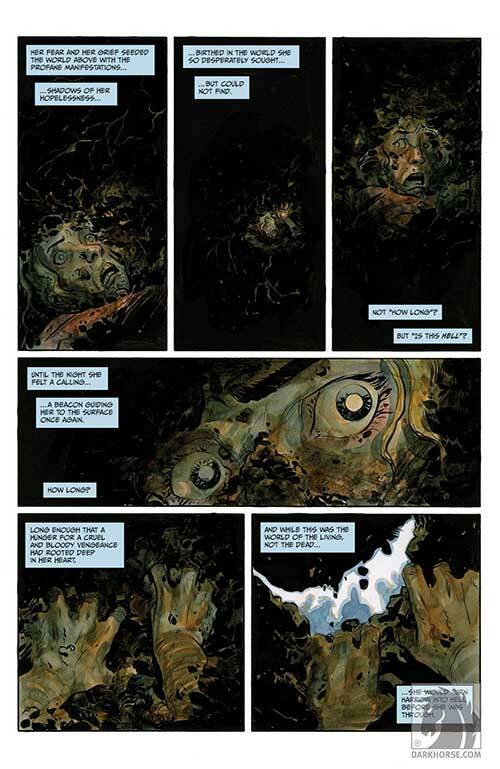 From the opening pages that demonstrate the depths of Hester’s dark powers to the grotesque finish to Emmy’s battle with Kammi and its after effects, Crook’s visuals make every page worth pouring over. The detail and use of color is excellent, the layouts effective and engrossing and the ever important human characters drawn with emotion and character. This issue also features a Tales From Harrow County short story in the form of The Radio, written by Rhiannon Rasmussen-Silverstein and illustrated by Christianne Goudreau. It tells the story of a woman named Joan who happened to be the first person in Harrow County to own a radio. In addition to collecting issues 25 – 28, this trade paperback also includes a few pages of Crook’s sketchbook (with notes from editor Daniel Chabon) and a very cool double page spread in the very last pages that is exclusive to this collection.